For the month of October, an unusual collaboration between the DC Public Library Special Collections and the DC arts space Rhizome has transformed Rhizome’s Takoma, DC home into a hub for exploring the history of similarly-minded, multidisciplinary, and independent arts spaces in DC. Featuring archival material — including photographs, audio and video recordings, flyers, and other ephemera — RETRO[per]SPECTIVE focuses on five influential DC venues: Museum of Temporary Art and d.c. space, which both closed many years ago, Union Arts, which shuttered in 2016, and the still standing venues DC Arts Center and Hole in the Sky. Materials drawn from DC Public Library Collections, as well as other institutional and private collections, were selected by librarians Ray Barker and Maggie Gilmore, in conversation with individuals connected to the respective venues, and with installation assistance from independent curator and exhibition consultant Lauren Abman. More than a collection of objects, the project attempts to embody the spirit of the spaces it represents — unpredictable, a little messy, and wholly unique. I spoke with Ray, Maggie, and Layne Garrett, Program Director at Rhizome, about the exhibition. Blair Murphy: I was hoping you could start off by talking about the library initiatives that the show grows out of. It is sort of unconventional or unexpected that the public library would organize a show like this. Maggie Gilmore: The strategic plan for the DC Public Library now includes “local history and culture” and also “strong communities.” So, the local history and culture component is relatively obvious in that we have our special collections and really strive to focus on local collections and on ensuring that we're capturing what has happened and is happening in DC within our archives. We're always looking at ways to bring our archives and special collections to life and ensure the public is interacting with them and understanding that they are usable collections. Doing things like this in alternative spaces outside of libraries is a really excellent way to share that information and to spark the user's understanding of what the library is up to. The “strong communities” component of the strategic plan is a little more subtle, in that the library as a DC government institution strives to support cultural endeavors, artistic content and the community that is a part of that. 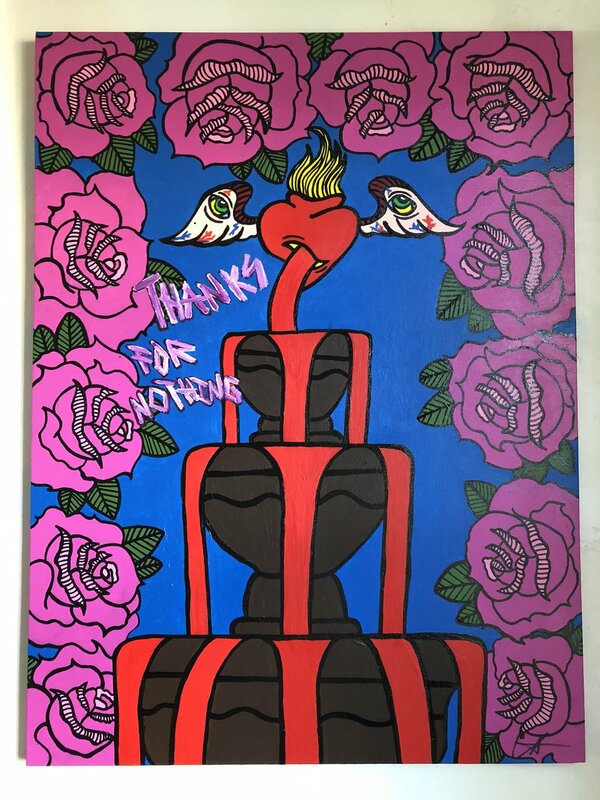 So the library over the last several years has taken a look at how we can support musicians and artists and performers and presenters and educators who are doing programs within our library spaces. Blair: How did the collaboration between Rhizome and the library come about? Ray: So, Steve Korn [Rhizome Co-Founder], Maggie, and I came out here in December of 2017 and Steve said that he wanted to do a history of venues. We just threw a list together, like a wishlist. So it was mostly Maggie, Steve, and myself at that point. Then it sat dormant for a year. But then, can I say a plug for Layne? Layne was brought in and just helped build the structure in terms of the programming, in terms of how to work with the space and how to get stuff. Blair: So you both have the perspective of being librarians and archivists - how does the exhibition reflect that perspective? Maggie: Well, it’s sort of like self-promotion, because as people recognize the capabilities or the possibilities of what the public library can be involved with. Then, they may have more interest in donating collections or volunteering their time to process collections, but more critically, donating collections. But we are also exploring and experimenting with exhibits and how we present material and we've learned a lot this last couple of years. We've never had exhibition staff really as part of our structure. Once the MLK Library reopens we will have exhibit space that will be utilized on a regular basis. So there's a little bit of that in this as well. It's just another opportunity for us to explore what it's like to present material to the public and see what works and what doesn't work. Ray: I didn't want this to be a Ray Barker project. I wanted it to be Ray Barker, archivist with DC Public Library Special Collections, Washingtoniana project. And so what does that mean? The oral histories that we're featuring are from our collection and all those flyers up there are from the Punk Archive. And so the idea was, someone would look through the exhibit and it was really important to see where the objects come from. We assign each object to a person or a place and so that was really important and as information professionals or librarians or archivists, we're aware of the value of those primary sources that are out there. Blair: With any show like this or any kind of looking back to these spaces in the past, there's always the risk of nostalgia potentially. And is that something you thought about? Layne: Yeah, I think it's interesting that some of the same struggles, we are still dealing with them and they've intensified, in terms of just having space to do things that aren't financially lucrative. Ray: The closing panel is about the nuts and bolts so that will bring the conversation to today. I want Steve Korn and Layne and Julianne Brienza [from Capital Fringe], B. Stanley [from DC Arts Center] and Mike O’Brien [from Hole in the Sky] to tell us how do you do it? What is your budget, what are the resources, and how does programming work? I think that will push against the nostalgia. Maggie: I think that there are people who participated in activities at d.c. space or MOTA that have learned something they didn't know about those spaces before. I think that's another way that you get around some of the nostalgia effect, that question of what are you adding to their conversation? Layne: The other side of that is there's a lot of people involved here that weren't necessarily familiar with the history and the precedents for this kind of thing in DC. Maggie: Some of the very people that were part of d.c. space come to Rhizome shows and perform. You may not know that you're having a friendly chat and a beer on the back porch here with someone who also had a beer and a chat at d.c.space in 1985. Blair: I think the special collection that people are the most familiar with is probably the Punk Archive. But are there other special collections within the Library that are related to the show? Maggie: Yeah. Washingtoniana is our local history division. So within that there are a plethora of things that relate to local history, obviously. Musically speaking, we've been working toward establishing a Go-Go Archive. It's very small as far as the content goes right now, but that project is more about establishing the relationships in the way that we did with the Punk Archive several years ago and getting the trust of the community first. 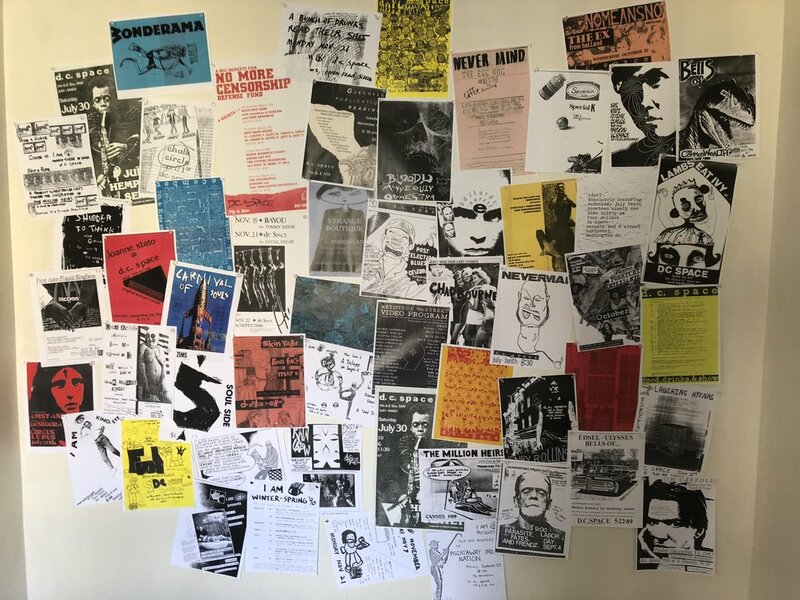 Then we see where it goes from there, asking ‘what is it that the Go-Go community needs from us as an archive?’ It's not the same needs [as the Punk Archive] which is really interesting and a whole other conversation. Ray Barker: In terms of this show, there are also the oral histories and those are very raw. Blair: And those oral histories are something that you started more recently, Ray? Ray: Yes, this past year. I’ve conducted roughly 25 interviews—almost 30 hours total—with people associated with the arts venues featured in the exhibition, most of them related to d.c. space: interviews with founder Bill Warrell, artists who performed there like Bob Boilen, Henry Rollins, Ian MacKaye, contributors such as photographer Lucian Perkins, and several staff like Cynthia Connolly, and Claudia Joseph. The show excerpted two interviews related to MOTA—Richard Squires and Deborah Velders—and edited them together for people to listen to. I have a third MOTA-related interview, with Rogelio Maxwell, and an interview with one of the founders of an early version of the HardArt gallery, Paul Bridgewater. I also did a short, maybe 30 minute interview with WPA founder Alice Denny. Once the backlog of interviews are transcribed and edited over the next year or so, they will be available for researchers online through the Library’s digital portal, DigDC. Maggie: And that's part of the DC Oral History Collaborative that the DC Public Library is a part of, so this broader initiative to collect oral history from DC residents in general and Ray and I and several other Library staff are translating that into music and theater and arts oral history. The other piece that we didn't really get to is the Rhizome house history research that we did. Our colleague Julie Burns did a lot of the legwork, just digging through microfiche and deeds of sale and records from the property at this house. Rhizome was a hair salon for like 10 years before it became Rhizome. That's why we invited Naoko Wowsugi to do her ‘Amber's Hair Salon’ performance here. Blair: There have been a few independent efforts to research and archive DC art history over the last few years. Jess Solomon’s Meridians Lab at Transformer was one and there was also John Anderson and Robert Bettman’s Jefferson Place Gallery project. My own project, The Lansburgh’s Notebook, at Flashpoint, focused on arts spaces in downtown DC. DIRT is actually named after a project that happened at Museum of Temporary Art. It’s exciting to have seen those more DIY efforts and then see the Library getting involved and bringing more institutional resources to the table. I know the oral histories specifically were partly inspired by the DC edition of We’re SO Not Getting the Security Deposit Back, a zine I collaborated on with Natalie Campbell and James Huckenpahler from Beltway Public Works and Paddy Johnson from ArtFCity which focused on defunct artist-run spaces in DC. Ray: Absolutely. We need to say it - It came out of [the zine]. So picture someone opening up that zine and this light and all these things jump out of it. That's because it said the name of the place, where it was in DC, what it was and the people. So it's always about the people, like there are people behind Rhizome… That's one of the themes of that zine, it listed the names. So then I thought, I should go find out where those people are. I was just really curious. The first step after reading your zine was to start working on the program at Goethe Insitut Out There: The Self-Created Artist in Washington DC which was in January of this year. We had 80 or so people in the basement there and everyone seemed invested in the program and the conversation. I found that encouraging, and wanted to see how else we might explore these issues. Steve Korn at Rhizome just coincidentally had this idea to do a kind of history of these places. Blair: So spaces like the ones highlighted in the show often don't get documented or archived because there aren’t resources, there's not the impetus to do it, it's very much of the moment and then people scatter and it doesn't happen. If, in some cases, they are documented or archived, it's often done by people who were involved. In this case with what the library is doing, you're bringing an outside perspective which may offer a reflective distance or a more historical perspective that lets you analyze broader patterns. Is there a way that the archival efforts at the library speak to the usefulness of that outside perspective? Maggie: Yes. I think it kind of sums up everything we've been talking about because, ideally, if you are coming to the archives to do research and you had a narrow focus on, you know, ‘I want to see show flyers from d.c. space from 1985 to 91.’ Then you will look at a finding aid and see all of these other names and other dates and other spaces. And so even just going and physically trying to pick one piece out of an archive, you become inspired to learn more about what else you are witnessing. I think we experience that in our profession on a daily basis. You get a little grain of something interesting and you want to follow it and go down the rabbit hole, as Ray says often, and there's obviously so much to learn about. We all have gaps in our knowledge about something. So, hopefully in doing projects like this and just strengthening our collections then yes, we are contributing to that broader perspective. Ray: I guess I would also add that the library as a neutral entity didn't contribute to the scene, but it's kind of like our way of contributing. I keep using that word contributor because it could be a musician, it could be the person that made the flyer, it could be the person that made the burgers at d.c. space. We are the contributors in providing a service of preservation or documentation. Maggie: Then, putting people in a room together to realize that they each have their own perspective hopefully is part of that too. RETRO[per]SPECTIVE is on view at Rhizome DC through October 30. A closing panel and community discussion will take place on October 30 at 7pm, with B. Stanley and Eames Armstong (DC Arts Center), Mike O’Brien (Hole in the Sky), Steve Korn (Rhizome), Julianne Brienza (Capital Fringe), and Maggie Gilmore and Ray Barker (DC Public Library).